In CloudStack, it is possible to create a “shared network” with public subnet. 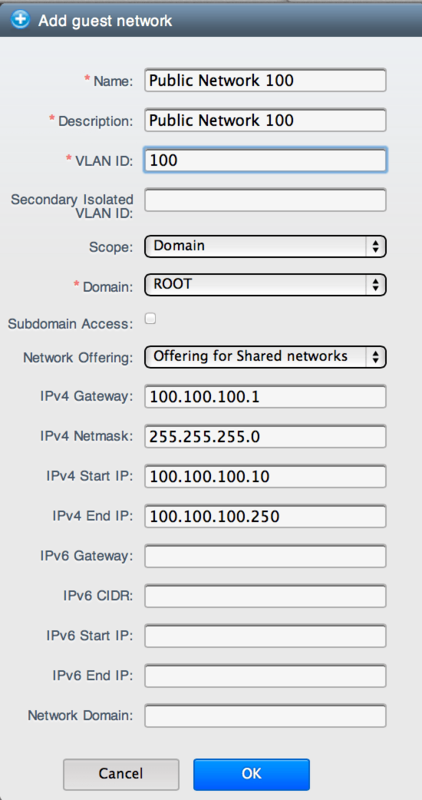 VM instance created inside this “shared network” will have a public IP assigned directly to its network interface. Why would you need a “shared network” with public subnet? Many hosting providers prefer to create VPS instances where a public IP address is directly allocated to the customer’s VM. It is also possible to have a public subnet dedicated to a customer’s domain (and his subdomains) by using the domainid option. Only accounts belonging to a specific customer domain will be able to see and create VM instances on this shared network. In CloudStack 4.2.0, the UI bug has been fixed. The shared network can be created using the UI. The VM that you create would have an IP in the 100.100.100.0 range instead of the usual 10.0.0.0/8, 172.16.0.0/16 or 192.168.0.0/24 RFC1918 private segment. Please substitute 100.100.100.x with a real valid IP range for your network. This would be a routable subnet assigned by your Internet Service Provider. Are you referring to the CloudStack’s “public” traffic type? If so, In ACS 4.2, while adding the shared guest network, you can select the physical network by selecting the traffic label as ‘public’. This will ensure that the traffic flows through the “public network” that’s assigned for “public” traffic. Would it be possible to create a “direct-public” shared-guest network without the use of VLANs? In my case the physical hosts have one interface eth0 which speak to the internet without vlans, and one interface eth1 which supports vlans for internal communication. You require VLANs for creating a shared network inside a CloudStack Advanced network. Thanks for info, unfortunately I need to keep using the already advanced networking zone and on top of a shared-public network without using vlans. Your articles have been very helpful. When I create my shared network only the private NIC shows up NIC0 my public card is NIC2, but it is not in the list. Any idea why my public NIC does not show up in the list when I go to create a network like this? Is there a setting I need to set to make that happen? As a follow up to my previous question. I believe the problem is I did not add “guest” traffic type to this physical network interface when I setup the zone. Is it possible to modify that after the fact? One more follow up. I was able to add the guest to the public physical network by hacking the database. I added the Guest type to the physical_network_traffic_types table and then had to assign a tag to the existing and newly created guest networks and place that tag into each NetworkOfferings (one tag per offering). Hi Shanker Balan! I need to use CloudStack’s “public” traffic type. but In ACS 4.4.2. while adding the shared guest network, I can’t select the physical network by selecting the traffic label as ‘public’ only ‘guest’ is possible. I have ‘public’, ‘guest’ and management labels. Error 431: The IP range with tag: vlan://2 in zone CNPA has overlapped with the subnet. Please specify a different gateway/netmask.